Bob Marley Shirt [bobmarley] - $12.00 : Tightwad Tees , Screen printing, embroidery, and design services with no minimums and unbelievable pricing!! 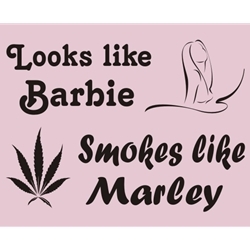 Many garment and color options available with images and lettering on front that says, "Looks like Barbie, Smokes like Marley". The Barb Marley Shirt ... it's a shirt waiting for my dreams to come true.